If you have sidewalks, patios, pool decks, or other sinking concrete surfaces, you may initially think your cement contractor is to blame for the eyesore. While poor workmanship and materials can certainly cause uneven concrete surfaces, shallow water tables and poor soil conditions can also wreak havoc on cement, causing sinking slabs. 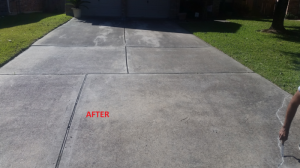 If you’re in the Houston area and dealing with uneven or unsightly concrete surfaces, contact Tilted Concrete Solutions! Our cutting-edge materials and quality concrete leveling make us the local leader in the concrete lifting industry. Check out our before and after gallery here. We would love to help you restore safety and beauty to your property by raising your concrete surfaces that have sunk and settled over time! DISCOVER THE BENEFITS OF POLYJACKING! Local to Texas. Competitors may use a generic expanding foam designed for any market. The polyurethane foam Tilted Concrete Solutions uses is manufactured right here in Texas and designed with the unique qualities of Texas soil in mind. Efficient. Once injected beneath the sinking slab, the foam used in our sunken concrete repair reaches 90 percent rigidity within 30 minutes. Lightweight and Strong. When compared to traditional concrete slurry compounds, expanding polyurethane foam can uphold significant loads without adding unnecessary weight to already unstable soil conditions. Minimally Invasive. Traditional mortar-based compounds require larger injection holes than expanding polyurethane foam. Waterproof. Expanding foam filler is waterproof whereas traditional fillers are not. This prevents future erosion and reduces repump rates. Reliable. The polyurethane foam used by our experts has resulted in lower repump rates (less than one percent), whereas previously used expanding foams resulted in repump rates as high as 15 percent. Eco-Friendly. When polyurethane foam is used in place of demolition methods, less waste is generated. these are just a few reasons why the expanding polyurethane foam used in our concrete raising services is superior to traditional methods and other competitor’s products. If you’re in the greater Houston area and need reliable, professional concrete lifting solutions, contact us today!